For the first time, Microsoft will offer a free Windows update. Microsoft says that Windows 8.1 -- the first major update to its radically altered operating system -- will arrive as a free update to existing users on October 18. 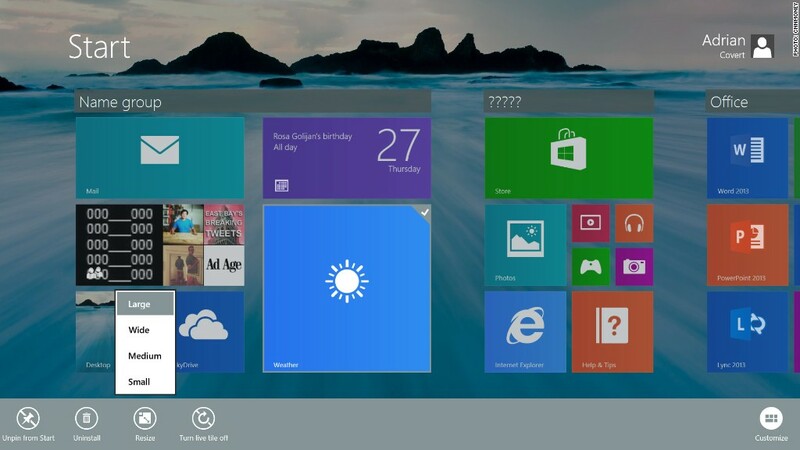 The new update is not another huge re-imagining of Windows in the way that Windows 8 was. Instead, it focuses on a handful of substantial improvements to its touch-friendly user interface, such as improved multitasking and a better Start screen. More importantly, this update will mark a lot of firsts for Microsoft (MSFT). Windows 8.1 will be the first annual, incremental update to add new features to Windows, and it will be the first time new features will be added for free. Although the company has previously issued "Service Pack" updates for Windows, those mostly consisted of bug fixes and security updates. There are good reasons for Microsoft's new approach to updates. The old strategy made sense in the era of CD-ROMs, but software updates can now more consistently and effectively reach consumers via the internet. It makes sense to roll out upgrades and improvements when they're ready, instead of waiting for a huge release every three to five years. And since Microsoft is pushing towards becoming more of a devices and services company, it needs to more tightly control the Windows 8 experience. The easiest way to get people on board with that? Give updates away for free. It may seem odd that Microsoft is just handing out its market-dominating PC operating system for free, when even Apple still charges for OS X. But times are changing. Mobile OS updates are always free, and Microsoft built Windows 8 to work just as well on a tablet as on a desktop. Charging for an incremental update would deter a large subset of Windows 8 users from bothering with the update at all. Instead, when October 18 rolls around, Windows 8 users will have little reason to avoid the prompt to update its system software. It will make computing easier for everyone.